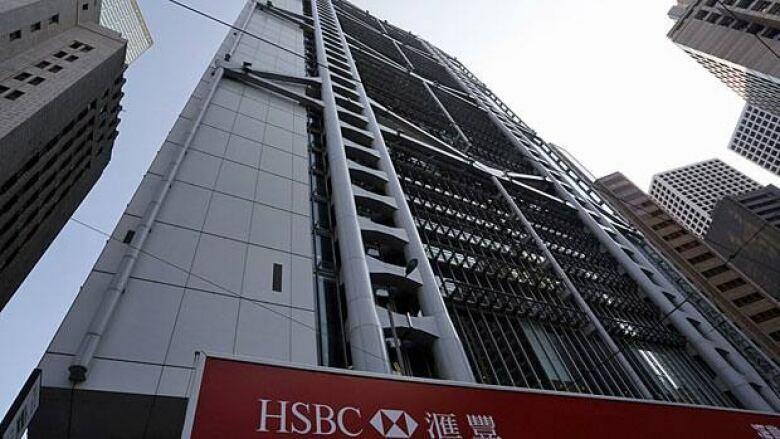 HSBC apologized to shareholders Monday as it disclosed it has set aside $700 million US to cover the cost of American penalties for lapses including its failure to enforce money-laundering controls in Mexico. The provision was announced as Europe's biggest bank reported an 11 per cent rise in pretax profit in the first half of the year following $4.3 billion in gains from asset sales. For the six months ending June 30, the bank made a pretax profit of $12.7 billion, up from $11.5 billion a year earlier. However, net profit was down 8.4 per cent at $8.4 billion from $9.2 billion the previous year, after accounting for a bigger tax bill. Most attention focused on the provision HSBC has taken for its legal problems. As well as costs relating to infractions in Mexico, the $700 million provision also takes in possible penalties for violations of the U.S. Bank Secrecy Act in a case going back two years, and any penalties from continuing investigations of possible violations of economic sanctions against Iran and other countries. Earlier this month, HSBC paid a fine of $28 million — 379 million Mexican pesos — to Mexican authorities for non-compliance with money laundering controls. A U.S. Senate investigative committee also reported that in 2007 and 2008 HSBC Mexico sent to the United States about $7 billion in cash. "Bulk cash shipments could reach that volume only if they included illegal drug proceeds," the committee concluded. HSBC Mexico acknowledged that it failed to report 39 suspicious transactions and had been late in reporting 1,729 others. The bank's chairman, Douglas Flint, and Chief Executive Stuart Gulliver apologized Monday for the money-laundering infractions. "We must demonstrate that we have learned from earlier mistakes," Flint said. "The banking industry is operating in a hostile climate so we must double our efforts to convince our regulators, customers and investors that we are striving for the highest possible standards. Only that way can we allay public fears and regain trust in our industry," Flint said. Gulliver said new processes and standards were being enforced in all of the bank's global operations. "HSBC is now run and managed as a genuinely global firm, making it easier to set, monitor and enforce standards," he said. As well as being dented by the money-laundering provisions, HSBC's first-half earnings were also hit by provisions of $1.3 billion for compensating U.K. customers for payment protection insurance. However, the bank made no provision for settling potential regulatory fines and private lawsuits, including one pending in the United States, related to setting the London interbank offered rate (LIBOR) and other indexes. In its program of getting out of non-strategic markets and non-core investments, HSBC has made 36 disposals and closures since early 2011. A further look at the figures showed that operating income was up three per cent to $43.7 billion while taxes paid more than doubled from $1.7 billion to $3.6 billion. Jonathan Jackson, an analyst at Killik & Co., said HSBC has a "strong funding position, with excess cheap deposits, and is well capitalized."